He was an alternate on the 15-member board of elected officials that set agency policy, but Ramirez found a way to stand out. 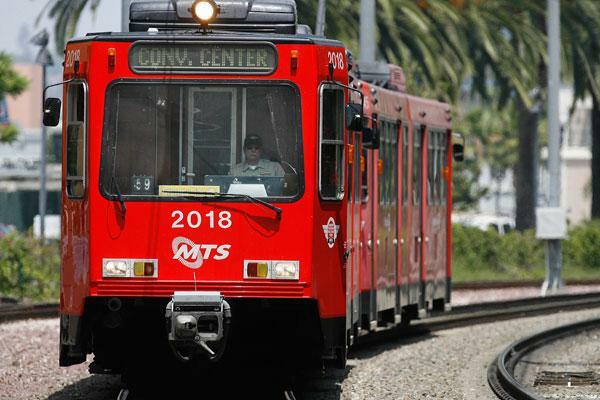 He cast the only vote against MTS’s proposed $240 million operating budget last week because he said the agency continues to neglect social equity in its transit service. I talked with Ramirez about his belief that public transportation in the region is systemically inequitable, how he’d like to see the problem addressed and other problems he sees in the transit system, including what he calls “inhumane” treatment of riders. Here’s a lightly edited transcription of our conversation. Can you expand on your comments, that you weren’t able to support the MTS budget because it lacked attention to social equity? I sit as an alternate for Chula Vista. I don’t get to (sit on the MTS board) very often. I was there maybe a year ago, and I raised the issue about social equity and wanted to know what MTS has done to understand that, for themselves, the board and for the public. If they’d studied it. It felt like to me based on own my experience in Chula Vista as a regular rider of the transit system, that it appeared there were inequities in the way resources were distributed throughout the county. The fact that you have beautiful bus shelters that are hardly used in UTC, but people in Chula Vista — elderly people and sick people have to stand in the sun to wait for a bus. What I wanted, what I hoped, was to study it. There’s enough money being spent here that people would want to know the answer, and to do it in a transparent way. Those were my arguments in a couple of meetings. Here it is, it’s budget time and they haven’t done that, they’re not interested, so I wasn’t inclined to support the budget. So your request out of the budget would have been that it included money to study whether the system is equitable through some combination of social definitions? I realize a study like this would require a great deal of technical expertise, but what specifically would you expect MTS to study in terms of social equity? I’d like to see if the (Capital Improvement Projects) budget is distributed across the county, to see how that money is being spent. I’d like to see if operational dollars are available in areas where people need more transit options. I’d like to understand if we are considering communities of special need, where you have more elderly, if there’s more transit in areas where people may not have choices. Those issues are important. We know, for example, that the blue line is the most-used transit line in the system. Yet, I see a lack of resources on this line. This is the one that starts in San Ysidro and goes to Old Town. Those are the sorts of issues that we’d like to understand. If you have a lot of ridership, and you’re not putting more resources back into it, those are things the board should consider. Have you done anything to force this conversation in the time between first mentioning it a year ago, and (last) week’s budget vote? I’ve talked to a lot of members of the riding public, and they agree. I try to ride public transit a lot. It needs a comprehensive, professional look. It needs an MTS that is interesting in discovering this. We need to know how we make decisions and where we put resources. They’re unwilling to do that. They see no value in that, or they would be doing it, and moving it forward. They’re not going to be responsive to an alternate on the board. If they’re not interested in hearing it, it isn’t something that gets done. Well, I had a number of concerns. I don’t like the policy of not providing bathrooms. It’s an inhumane transit system that doesn’t provide for basic human needs. That position is inhumane and reprehensible to me. I can’t support a budget that doesn’t provide for a humane experience on a transit system. It’s mind-boggling to me that anyone could support that policy. What it comes down to me is, you have people making decisions, on the board, who don’t use the system, because if they did with any frequency, they’d understand. I get that bathrooms are tough. They require a lot of attention, and there’s a cost associated with that. But if they’re not providing a service, they’re certainly not encouraging transit, which they should do, and they’re pushing out that cost to the surrounding community. You get off, and you go to a Starbucks or other local business. It creates other problems, and it’s not fair. If you want to open a taco shop in Chula Vista, they require you to provide a bathroom. If they require it of mom-and-pop entrepreneurs, why not of a public transit agency? So after initiating the conversation, had you done anything with MTS specifically to address these issues, prior to (last) week? I have talked to other board members. It just seems they’re more — they just seemed more interested in defending the agency than responding to what might be an important public need. I really don’t mean to single out anybody on the board, or accuse anybody, I think it’s just the structure of the agency and its oversight. I think it’s tilted away from greater scrutiny and oversight and it’s a different thing to do to have council members who are busy in their own community, they’re there on a part-time basis, to oversee in detail what this regional agency is up to. What happens next? Is this something you’re going to keep pushing for? The other people I’ve been in touch with is, my fellow council members in CV, I talk about this often. (Councilmember) Mary Salas is very aware, I told her my concerns before I went into the budget meeting. She indicated that she understood, and that I should vote my conscious, so she was supportive of my concerns. But will you continue to push this, with whatever power you have as a council member and alternate board member? I certainly am. As an alternate it’s difficult for me to be as involved as I’d like to be, because we do have a primary representative (Salas), and I have to defer to her internal reasons. I want a public agency that is going to assume authority, not pass the buck. It should be a matter of routine that these agencies look at the social equity issue for themselves, or they should stand up and say we don’t care about social equity and we don’t think it’s important in running a system in San Diego. Or, they should study it and explain it, so people like me aren’t just left with their own impressions, and just sort of guess at it and go off their gut. They could reassure the public that they’ve done their due diligence.